Several of my readers have commented that my recent topics offered nothing new to those involved daily in medically related litigation since I have been covering fairly common issues. Therefore, I've selected a topic for today's conversation that is much more rare. In twenty years of consulting in medical malpractice and personal injury cases, I have run across only a handful of closed-angle glaucoma cases. In fact, less than ten percent of all glaucoma cases in the U.S. are of the closed-angle variety. Glaucoma is a disease involving increased pressure within the eye and is one of the leading causes of blindness worldwide. 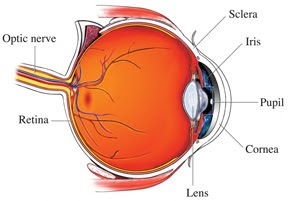 Fluid within the eye, the aqueous humor, is produced within the ciliary body behind the iris and continually flows between and iris and lens and circulates within the anterior chamber of the eye. 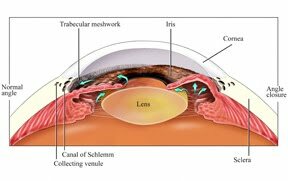 Normally, the aqueous drains from the eye through the trabecular meshwork at the angle where the cornea and iris meet. 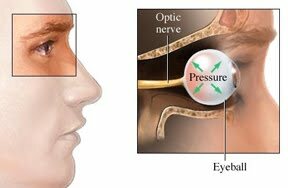 In closed-angle glaucoma the trabecular network becomes blocked preventing proper drainage of aqueous leading to a buildup of fluid and increased pressure within the eye. If this pressure persists or increases, it can lead to permanent damage to the optic nerve. Litigation involving closed-angle glaucoma often revolves around issues of misdiagnosis or delay in diagnosis. Patients presenting to their doctor's office or an emergency room suffering from acute closed-angle glaucoma will often have symptoms of severe eye pain, headaches, nausea, pupil dilation and distorted vision included halos or rainbows around lights at night. General practitioners or emergency room physicians do not have the tools or training necessary to correctly diagnose closed-angle glaucoma. Diagnosis can only be accomplished by an ophthalmologist who can utilize specialized instruments such as a tonometer to measure eye pressure or a gonioscope to allow for direct visualization of the angle. Prompt referral to an ophthalmologist is crucial to allow for timely diagnosis and treatment before permanent injury occurs. In cases I have encountered, valuable time is wasted as alternate conditions are tested. Often the emergency room physician may suspect a brain injury, aneurysm or tumor based on the symptoms including the headaches and nausea. CT scans or other radiological studies may be ordered to check the brain. These studies take time allowing the pressure to continue to build within the eye. The pain in the eye may also be misdiagnosed as a more common optic condition such as conjunctivitis or corneal abrasion. In such cases eye drops may be administered to relieve the pain. These medications may provide some relief to the patient's pain but only mask the further progression of the underlying problem within the eye. With timely referral to an ophthalmologist, closed-angle glaucoma can be diagnosed and treated promptly. Eye drops can be given initially to reduce the production of aqueous and reduce the pressure. Later, surgery will most likely be necessary to open the drainage channels at the angle. With proper treatment, the patient should have no permanent visual deficits.